Managing your diabetes requires a lot of care and vigilance. From counting carbs to testing blood sugar to injecting insulin, it is a time-intensive and deeply-personal process. However, your physician is an important resource for you in terms of understanding your condition and taking the appropriate steps to control your condition. Keeping up a dialogue with your doctor is important, as is knowing what questions to ask. You’ve Just Been Diagnosed: Now What? You should check before and after each meal to see how your glucose levels react to food, as well as before you go to bed or start exercising. Beyond that, the amount of testing depends on your particular goals and your medications and overall health situation, so be sure to cover specifics with your doctor. Be choosy – remember, your health is at stake. Interview more than one doctor if you’re concerned about getting the right fit, and don’t hesitate to ask all the questions you have. Write it down – bring a list of questions and concerns that you’ve prepared ahead of time to your doctor’s appointment. Go after your education – if you want to take advantage of diabetes education and your physician hasn’t recommended a resource, check out the American Association of Diabetes Educators. here. What is the ideal glucose level? Consistently high readings can lead to serious long-term complications, so the tighter your control is, the better. The American Diabetes Association (ADA) suggests maintaining a fasting blood glucose level between 90 mg/dL and 130 mg/dL, a level of less than 180 mg/dL two hours after you’ve eaten, and an A1C (a number that reflects an average blood glucose level over three months) of less than 7 percent.The American Association of Clinical Endocrinologists (AACE) suggests maintaining a fasting blood glucose level of below 110 mg/dL, a level of less than 140 mg/dL two hours after you’ve eaten, and an A1C of less than 6.5 percent. These guidelines must be individualized, and your physician should help you establish your personal ideal. People with type 1 diabetes require insulin because their bodies can’t produce it. 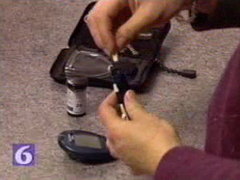 However, some people with type 2 diabetes may be able to manage their disease through diet and exercise. If that isn’t possible for you, there are a variety of oral medications available, and given the progressive nature of type 2 diabetes, you may need to consider using insulin at some point. You and your doctor should decide which medicine and how much is best suited for you. Where can you find additional support? Ask your doctor to recommend a good diabetes education program. Some doctors may have programs set up in-house, but many others will know credible sources through hospitals, pharmacies, and other clinical settings. Taking a class will expose you to a variety of specialists as well as introduce you to people going through the same transition. There are lots of things to check on to maintain your health. Ask your doctor about scheduling regular tests that check average blood glucose (A1C) about four times a year, cholesterol and triglyceride levels at least once a year, as well as kidney function at least once a year. Since cardiovascular and renal complications can accompany diabetes, preventive measures like routine testing are critical. According to the American Diabetes Association, you should also make sure your doctor tests your blood pressure and feet every time you visit. Your physician should be able to recommend some names and establish if and when you should see other specialists. Eye doctors, podiatrists, cardiologists, and nephrologists are the most common specialists you may want to consider visiting to assess your risk of complications and preventive measures. From retinal damage to kidney disease to poor circulation, diabetes can affect your entire body and you can’t handle it all on your own.